NPR Stations and Public Media The links between NPR and Member Stations are many and deep. At the core, we share a mission to inform the public, increase understanding of the world and enrich the experience of everyday life. 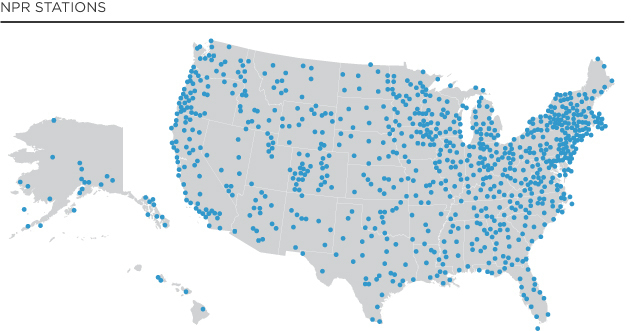 There are over 1000 NPR Member Station signals broadcasting across the United States. The links between NPR and Member Stations are many and deep. At the core, we share a mission to inform the public, increase understanding of the world and enrich the experience of everyday life. 98.5% of the U.S. population is within listening area of a station carrying NPR programming. Find a station near you. NPR Member Stations are independent, locally owned and operated broadcasters. In an era of media consolidation and corporate ownership, these local stations are becoming an increasingly rare and even more vital source of local news and information for the communities they serve. About two-thirds of stations are licensed to, or are affiliated with, colleges or universities. The remaining third are governed by community-based boards. Some stations are operated jointly with public TV stations. Each Member Station determines its own format and schedule. In creating their broadcast schedule, Member Stations have several options. They may choose to select from NPR programs such as Morning Edition, All Things Considered or Wait Wait...Don't Tell Me! ; pick up programs distributed by other public radio producers, stations or networks; and/or create their own local programming. Stations create their schedules based on the interests and needs of their local audience. Some stations focus on news and information while others follow a music format – with programming ranging from classical, to jazz, to AAA or world music. Member Stations are partners with NPR in newsgathering. Member Station reporters provide hundreds of news pieces every year, putting NPR News on the scene wherever news happens. Station reporting makes up a key part of NPR's national newsmagazines and newscasts, and is especially critical for the coverage of milestone news events such natural disasters, the impact of war on local communities, and national elections. These reports bring local flavor, relevance and perspective to NPR programs, with local reporters and hosts who are deeply familiar with the issues, events and people they cover. Several programs that NPR distributes are produced by NPR Member Stations, not NPR. These include top-rated news and cultural programs such as Fresh Air with host Terry Gross from WHYY (Philadelphia); 1A with Joshua Johnson from WAMU (Washington, DC); On Point from WBUR (Boston); and World Café from WXPN (Philadelphia). Public radio stations choose to apply for NPR membership. Once they meet the criteria (including mission, 18 hour a day broadcast operations, minimum number of staff), they pay annual membership dues and are entitled to the benefits of membership. This includes a set of rights to NPR programming, content, digital distribution streaming and inclusion in mobile products. Members may associate their brand with NPR's, and they have a voice in NPR's consultations with its Members and a vote in the election of the station manager members of the NPR Board of Directors. In addition to paying membership dues, Member Stations pay fees for the individual NPR programs they choose to broadcast. These fees and dues make up the largest source of operating revenue for NPR. What you hear every day on your local station grows out of a long-standing partnership between NPR and NPR Member Stations. It's programming and content that you make possible, by giving support to your local station. Read a more comprehensive overview of the funding story at NPR and at our Member Stations.